Synonyms: It's Not My Fault That My Friend Is Unpopular!, WataTomo, Watashi no Tomodachi ga Motenai no wa Dou Kangaete mo Omaera ga Warui. A spin-off 4-panel manga featuring socially awkward friends, Tomoko and Yuu, in middle school. Parent story: Watashi ga Motenai no wa Dou Kangaetemo Omaera ga Warui! The prequal to watamote claims to be from the perspective of Tomoko's best friend Yuu-chan, however the familiar lead quickly takes over. Despite its misleading premise, WataTomo is a rather pleasant look at the often brought up middle school days of our unpopular high school girl. While the cringe humor and otaku references are still very prevalent in the series, there is one notable difference; the portrayal of Tomoko herself. In the main series shes presented as an inversion to the typical shy character trope in that shes extremely unlikable in her thoughts and to many people (most notably her brother and Kotomi). That being said she still comes off as pretty sympathetic, as many of her problems aren't entirely her fault. This manga completely throws the sympathy out the window, as she is just a straight up prick here. While flashbacks in the main series give a good reason why Kotomi doesn't exactly like Tomoko, this series completely drives home how unlikable Tomoko was back in middle school, and boy does it do it well. Yuuchan is also shown to be not much more than a super innocent girl (borderline to a fault). There is a bit of retcon in her character however. When she was introduced in an early chapter of WataMote Tomoko showed rather little interest in her other than "she was my friend from middle school". You'll quickly notice here that her relationship with Tomoko isn't all that different from her later appearance. 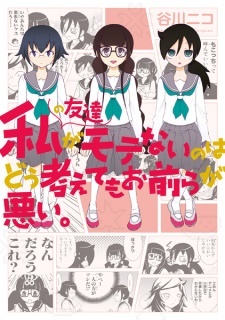 Overall this is a short but enjoyable manga that I recommend to any WataMote fan. It doesn't go over Tomoko's entire time in middle in as much detail as the main series does with high school, but it does provide some rather pleasant character development that fans are sure to appreciate.